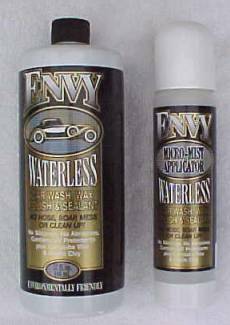 ENVY Washes, Waxes, Polishes & Seals any non - porous surface you apply it on, without the need for our most precious natural resource WATER !!!! "Everyone Will Envy The Results"
The Choice is Yours ! ! Think of the way you wash, wax, polish & detail your vehicle today. Get ALL your stuff: water, bucket, sponge, soap, wax, chamois, water hose, nozzle, towels, etc. etc. Water down the car - fill bucket with soap and water – wash the car – rinse the car – rinse out sponge + bucket – quickly chamois before you get water spots. Then your ready to WAX which could take hours waxing & buffing to a shine. Once you start you are committed to the end. With ENVY you are in control of your time, finish your car when you want. ALL YOU NEED is the "ENVY" reusable micro/mist applicator and two terry cloth towels. ENVY with its UV protectants when used on windows also prevents premature interior fading due to the harmful effects of the sun. The Kaolin Clay is not a wax or polish or glaze or compound. Kaolin Clay is a surface preparation that smoothes and also cleans contaminants from the paint before it’s buffed or waxed.Also the majority of vehicle cleaners state on their label "Contains Petroleum Distillates"Our label states "Contains Aliphatic Hydrocarbon" an earth friendly biodegradable ingredient. ENVY is The Only Product of this Type that Can make that claim ! ! ! How Does ENVY Work ? Applied with it’s reusable pressurized micro/mist applicator (using no fluorocarbons) ENVY’s unique ability to encapsulate and emulsify the dirt particles lifting them off the surface (thus no scratching) then just remove with a clean terry towel. Note: Just 16 oz. of ENVY will wash, wax, polish & seal on average 6 to 8 autos and save over 1,000 gallons of water plus saves our earth’s water supplies from contamination. Cars, Boats, Cycles, RVs, Snowmobiles, Bicycles, Jet Skis, Airplanes, Yachts or your Classic, Vintage or Antique and more… Reduces friction on Skis, Sleds Etc. Don’t Forget inside your Home or RV, do your Tub, Toilet, Shower, Appliances and More. When used on Windshields, water will just bead up and roll off virtually eliminating the need to use windshield wipers, Truly amazing !!! ENVY also prevents premature interior fading. Also great for a quick ShoeShine, to clean Eyewear, Safety Shields, Optics, TVs and Monitor Screens. ENVY repels dust and fingerprints, minimizes small scratches and swirl marks and makes them optically clearer. Race Drivers, Athletes, and Fire Fighters will appreciate the clarity and anti-static that keeps Helmet Shields clear, clean, and dust free much longer. Great for boat owners, ENVY also protects against algae and barnacles. If removed while still damp ENVY may be used on rubber and vinyl trim & plastic too ! ENVY Contains no acids and it's strongest abrasive is baking soda. Yet you will find it to be about 1/4 to 1/10th the effort of most products you have tried. And you will find it will last many many times longer then others. 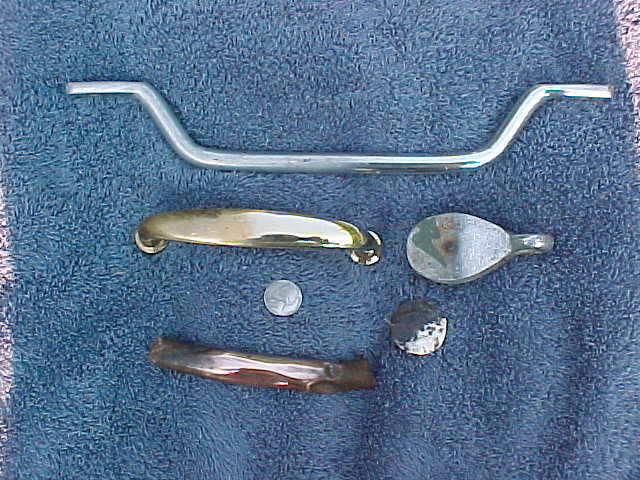 ENVY Metal Polish - Works on all Aluminum, Copper, Brass, Nickel, Sterling Silver and Jewelry. ENVY Tire Shine "You've Just Got to Try It"
Shines Instantly ... No Wiping! ENVY Tire Shine shines tires instantly as you spray it on. This unique formulation requires no wiping with a cloth or sponge. ENVY Tire Shine is formulated not to sling off tires. ENVY Tire Shine is a unique formula developed for professional car detailers. ENVY is the detailers' secret for a great look on tires. With over 2 years research, ENVY has been tested extensively by hundreds of independent professional detailers worldwide. Directions: Shake well. Spray onto a clean, cool, dry tire surface. Let penetrate for a few minutes. For a maximum shine, repeat application if necessary. Park your vehicle in a shaded area and avoid applying ENVY in direct sunlight. (Just as you would not do a conventional car wash in direct sunlight) This will keep the product from drying too fast and allow the surfactants to penetrate, lift and emulsify the dirt and grime from the surface. Use two clean 100% Cotton Terry Towels, one for cleaning and one for buffing. When Laundering your soiled towels, allow them to soak first, then launder as usual. DO NOT use bleach, fabric softener as these products will make the towels less absorbent. Each time before filling applicator shake filler bottle approximately 20-30 seconds, do this by holding filler bottle UPSIDE DOWN and twisting your hand vigorously from left to right. Also follow the same procedure before using filled applicator. It is very important to make sure all ingredients are completely mixed. To ensure a good spray, DO NOT fill the applicator bottle past the fill line, fill to about 1/2 inch below fill line. Using the pump cap, press up and down approximately 20 times until a resistance is felt, (cap will rise about 1/2 inch) continue to pump the applicator during applications with one or two pumps after each spray. Spray mist over soiled area using a sweeping motion, keeping the applicator about 18-24 inches from surface, covering about 3-4 sq. ft. each time. Let set up for about 5-10 seconds, then wipe with first towel in ONE direction, (you are now picking up the dirt that is floating in the ENVY solution) first easy, then a little harder. As hazing appears, use second terry cloth, and buff in circular motion to a clean and gleaming finish! When using to clean glass, chrome etc etc. wipe product off right away! When it comes to glass, LESS IS BEST! Same instructions can be used for any other Nonporous surface re: RV's inside & outside. ENVY can even be used to clean carpets and fabrics...CYCLES, BOATS, WINDOW GLASS, SHOWER STALLS, or what ever you can think of! Now use the first towel, gently rubbing in one direction to remove dirt and grime. As filmy haze appears, use the second cloth and buff in circular motion to a clean and gleaming finish! If the MICRO MIST APPLICATOR seems clogged or doesn't spray properly - even after a thorough shaking - turn the bottle upside-down and depress the spray valve for 5-10 seconds to expel air only. Then pump additional air into the bottle and retry. Repeat this procedure two or three times, if necessary.